Ranger give 95gr TMK’s a try. I know a few guys who swear by them in 6br w/ 4166. Ps every pipe that Josh has spun for me is at minimum .25moa or better hammer. I have to give a slight edge in recoil reduction to the Jet Blast. The other advantage is the JB helps to take majority of concussive wave off the shooter. This is a feature Josh really strived for even tho it has rearward angled ports like the popular fish gill designs, i.e. the Hellfire. Only concern w both is you’ll want an adjustable to cinch the jamb nut on the JB. When it’s lightly torqued it won’t come loose. The 419 uses the hand tighten nut but a slight torque w a strap wrench is also advised. Not to drag up an old thread, but since the last post I've been busy shooting a 6 CM Bighorn Origin and hadn't played much with the 6.5 CM Rem 700. A few months ago, I had LRI shorten the barrel to 24 inches, flute the barrel and perform the bolt timing work. I also glass bead blasted all the parts before assembly. I just got it rebuilt and swapped out the PVA muzzle brake for a Thunder Beast CB in preparation for my thunderbeast ultra 7 that is in jail. Without the mag it weighs 13 lb 7 oz. I'm hoping to get back out to shoot it this coming weekend hopefully have similar results to past. We'll see what happens. Now on to the pics. @stevieb92 How do you like the Origin? 30.7 vertical is damn near perfect. Berger’s as a hunting bullet are called “bang flops” for a reason. When you say “coming apart” I believe the majority of us interpret that as the jacket separating from the core in flight. Curious what Bergers in what cartridge rifle combination aren't holding together for you? Load, fps? Barrel, round count? Me to. I’ve sent thousands of Berger’s w np. Lots of good valid opinions here. The target tells the tale though. 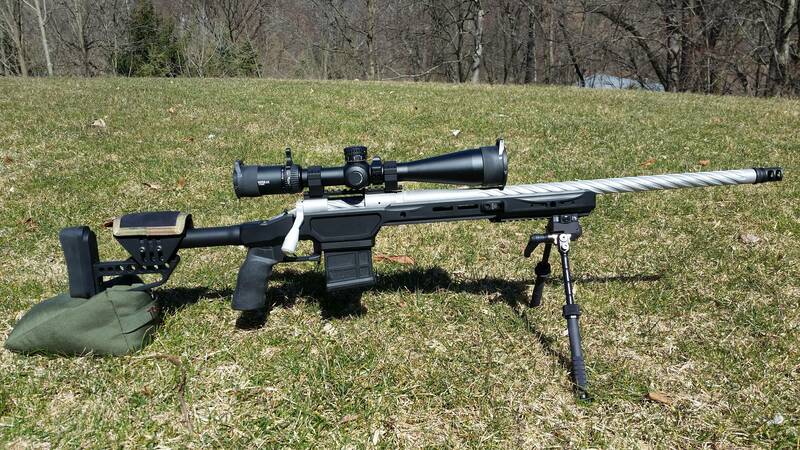 I'll get boo'd for this but other than a 10 - 15 shot velocity ladder the chronograph should get left in the bag until there's 150 - 200 rounds on the barrel. There's no point in chasing SD & ES on a barrel that's picking up speed with every 10-20 rounds. Use the velocity ladder to find a load to tune seating depth, settle the barrel and have fun. By the time you get to 200 rounds you'll know the seating depth and a simple powder test will put you in the single digit numbers but good chrono numbers in my experience are in a .1 or occasionally a .2 powder charge window. If you don't have a good scale you can burn up a barrel chasing them. You can shoot very small without single digit chrono numbers but good chrono numbers don't guarantee small groups. Tune by the target not the chrono. I have a magnetospeed and rarely use it for anything but an initial velocity ladder. After you get a good load that shoots small run 5 across the chrono so you have an average fps number for your app and put it away. Edit: If you happen to find that killer load with low numbers at say 80 rounds fired that's nice but it won't be the same by 120 rounds. Hi Everyone; been getting great advice on my first rifle reloading with the 6.5 Creedmoor for my Savage #12 LRP and I have a question about the bushing needed for the Redding type 'S' neck sizing die. My factory Hornandy 140 gr has a neck size of .291, My virgin empty Lapua brass has a neck diameter of .289. I ordered a bushing size .290 ---- 1/1000 less than a loaded round. That’s correct. BUT I would also get a .289 as either a .001” or .002” of neck tension including spring back will more than likely give you the best grouping. Also if you are going to be running ammo from magazines vs single feeding the .002” will be a tad more reliable. Good luck. General Discussion / Re: Can you wear one out? I have “shot out” barrels that can still print respectable groups. Problem is when the throats get terminally roasted and pipe is firecracked to hell the velocity becomes erratic. I’ve tracked it and the barrels will run consistent speed for hundreds to thousands of rounds. Inevitably the velocity will drop to a lower plateau (in my experience 10-20 FPS avg.) and stabilize there for a few more hundred rds. Next loss in velocity will stabilize for a couple hundred rds. But the round count for the “next” plateau is always diminishing , (example, thousand..few hundred..couple hundred..etc.) Obviously increasing powder charge to compensate for chasing the lands should be maintained for the whole life of the pipe, which is a royal pita as the “plateaus” get shorter. Eventually the proverbial cliff appears. MV falls off at a steaper drop of 30-40fps and it’s anybody’s guess for how long this time, 100, 50, 20 rds,??? I hear what you’re saying and yeah I concur, “cooked” pipes can still print decent groups- sub 1 moa. But I screw a new one on based on what velocity, not groups are telling me. One thing to hold for wind and adapt as it changes, but reliable mv is what us steel guys chase. 30fps loss in the middle of a match can be 2-3 tenths shift in elevation out deep, then add in heavy vegetation where seeing splash on a miss becomes impossible.. oof, guessing makes for a lonnng day. Reloading / Re: ruger rpr 140 hybrids, 2843 fps too much? 2840 is not unusual out of a 24-26” pipe in 6.5 Creed. We’ve chronoed factory ammo that avg. 2835. Others have hit on the brass factor. Your primer pockets will more than likely suffer a short life w reloads. If you can live w that and are digging the node your in, I say run em. You got a taste of what stress adds to the game. PRS is such a rush because you are under the gun not only w par times, but building position (typically on the clock) and shooting from awkward props. The guys I shoot with are downright sadistic. I’ve shot stages w 60 sec par times, all gear stowed on/in pack except rig. Shooting over barrier with no contact allowed. I chose Tripod-30sec to deploy, and 30 sec. to get off 10 rds at 400yds. Or how bout 5 rds off top of barrel at 66% IPSC at 710 yds, in 30 sec. from port of arms mag out. WooHoo 若 pricks lol. But it makes you better. Takes a lot of practice to get smooth and fluid in this game. Breathing is really important and can be a great clock. My natural respiratory pause is about 7 sec and try to drop shot on the bottom. Helps you know where you are w clock and helps vision believe it or not. Most guys/gals who try it are either completely hooked or walk away w middle finger straight up to sky. I was going to have them spin up a barrel for my RPR but they do not offer the 6x47 lapua in a 7 twist. Sweet, I had a 1sd 1es on my BRA last spring on a 3 shot group. I shot 3 at 30.5 over the mag speed. Then I shot 3 @ 30.4 and 3 @ 30.6, all 6 shots were just over an inch at 600 yards. Some really nice hand loads their, Dan. You probably wish the Dasher shot like that all the time. Or is it that your the weak link in this. Are you still running the 105's? Is that a different load? Seems faster.